As of Saturday, November 1st it is officially (yet unofficially) National Peanut Butter Lover’s Month. While this holidays origins are unclear, one thing is certain, it’s time for a peanut butter feast. Coincidentally, as of November 1st, it is also the Peanut Butter Boy’s 1 year anniversary! After one full year, I’m still going strong and my love for peanut butter has not diminished one bit. To celebrate, I’m sending out a call for your favorite peanut butter recipes. I want everyone to post and send me their favorite peanut butter recipe by November 30th (even if it’s an old recipe you’ve posted). At the end of the month, I’ll round up the entries and construct a (hopefully) large list of recipes! See the submission form beneath the following recipe. 1. 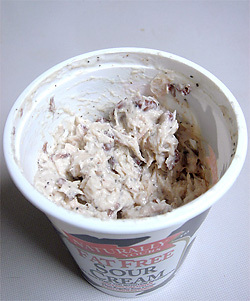 Mix all ingredients together and store in the refrigerator in an airtight container. Makes about 3 servings. 2. Spread between two slices of bread with a slice of cheese for a great sandwich, or forgo the second slice of bread and toast in a toaster oven for a peanut butter “blank” salad melt. Alternatively for a nice meal and presentation, serve on a bed of lettuce with celery and carrot sticks for dipping. How unusual. This reminds me of gado-gado. It’s an Indonesian salad with a peanut sauce. I’m not terribly clever with PB and savouries, so must really put my thinking cap on. I would never have thought of this, but I am definitely willing to try it! I think that sounds like a good idea…I mean, think about it, you would dip chicken or tofu in a peanut sauce, right? Why not make it into a sandwich? I’m not 100% sure how it might go with tuna, but I would be all for chicken or tofu. I will definitely have to give it a try! i’m very interested in this recipe! I never thought I’d see chicken or tuna teamed up with peanut butter. Other nuts sometimes go in these salads, I guess why not peanut(s) butter! Hmmm, guess it would have to be tried before knocked! I kind of had my doubts when I first saw what you were up to but after thinking on it for a moment I think your onto something. I trust your taste and I know you wouldn’t steer us wrong. I’m going to give it a try with chicken. If all goes well I’ll move on to the egg and tuna. Now this is probably the strangest peanut butter combo I’ve seen yet. Certainly not knocking it though. I’d honestly probably be willing to give it a try. I’m actually pretty tempted. Tuna good, pb good… why not, right? Heather, Those Nick’s and their peanut butter, it must come with the name. Can’t wait to see your pb recipe! Krista, Super smooth and just a touch “nutty”, it’s wonderful! Dee, Peanut sauce is always delicious. So submit a sweet peanut butter recipe and feel better! Marianne, It really does make sense, and I’ve been doing it with tuna and it works just as good as the chicken, I can’t taste much of a difference. Jessie, Well chicken and peanut sauce is pretty common in some cuisines but peanut butter is not usually paired with fish, especially tuna. Reeni, I suggest chicken first, but if you’re using canned chicken the taste is almost identical to canned tuna, especially when mixed with sour cream, spices, salt and seasonings. Post your results! Kristie, I love being strange! If you want to dive head first, start with the tuna, I bet you’ll be impressed =). Am SO excited that it is national peanut butter month. I will look around to see if I can find some good recipes for sharing. Also I like the idea for this recipe- so many ways to play around with it! You won Barney Butter from Kath!!! Congrats!! Hey, I forgot to say ‘Your one Smooth’ operator! What if I’ve already posted my favourite PB recipe in the past? Should I submit it? I’m kind of a rule-follower. Now this is an interesting idea, and one I’ve never seen. I recently converted my European fiance to a peanut butter lover, so now he and the dog can both enjoy your ultimate dog treats! I think I’ll try this one out on him next! I will admit only that there is a jar in the pantry, but it is eaten by the heman that lives under this roof! Very creative, I must say! I will be seriously considering this because I LOVE PEANUT BUTTER! Not too sure about the tuna and peanut butter combo, but I like the idea of your recipe round-up. Instead of putting peanut butter in the recipe, can we used ground peanuts? Would that count? I just made a chili recipe with peanuts. I’m with Heather no. 1 – scared and intrigued. I don’t like tuna, but I bet it would be good with tofu! Sorry, commented in the wrong spot! I agree with hangrypants above. Your recipe scares me a little, but I must try it. No judging on your um, interesting recipe from me :) That’s because I love to scarf down chunky peanut butter & bacon sandwiches (which is pretty odd to many!). Ooooh, another recipe roundup! Yippee, yippee! Ha ha, I love that this is called ‘salad’ – in England, salad has to contain at least one vegetable, even if it’s only boring old iceberg lettuce. I think this sounds like a great filling though – even in the absence of greenery. It makes me think of a satay sauce or a pale mole. I think I’d eat mine in a long crisp piece of sweet romaine lettuce. Congrats on one year! I’ve been following your blog (got hooked from KathEats). 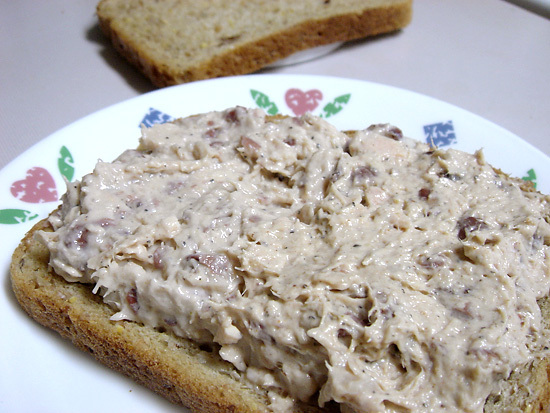 PB Tuna Salad…Memories of when I first met my hubby over 8 yrs ago. He was a trainer and was getting ready for a bodybuilding competition. His diet: 3 heaping tbsp of PB with a can of tuna! Whenever he opened the lid of his tupperware, the smell would be so strong that it would clear the room! He probably ate this 3 times a day (2 times/day after the competition). So of course I had to try it myself. The first time was not that pleasant – dry and fishy. I finished it and didn’t really think it was that good. Would you believe this: I craved it the next day! I must say yummy. The dry part works to my advantage too because it forces you to drink more water (gotta get those 6-10 glasses of water a day in). Oh, and get this…back then I was at the end of my natural pb and decided to experiment with it. I tried making a pb omelet (egg whites and tried to put pb inside and fold the other half of the egg on top). Mine failed probably because the pb was dry (I didn’t mix the pb well when I first opened the jar) and I’ve never tried again. I saw 2 yummy recipes for PB on this blog: http://velvetlava.blogspot.com/ and her blog is pretty good.